The scatterplot in section 7.4 is a plot we could use repeatedly. We demonstrate how to create a macro (SAS, section A.8) and a function (R, section B.5) to do it more easily. We’ll load the example data set from the book via the web (section 1.1.6), then make a plot of the real data. 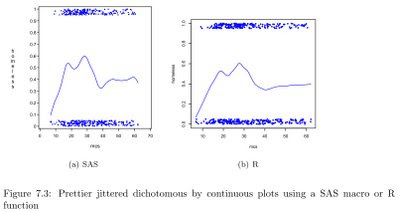 The resulting plots are quite similar, but still differ with respect to the smoother and the exact jitter applied to each point.